Relief Society Squares and Layouts! – It Works For Bobbi! Relief Society Squares and Layouts! 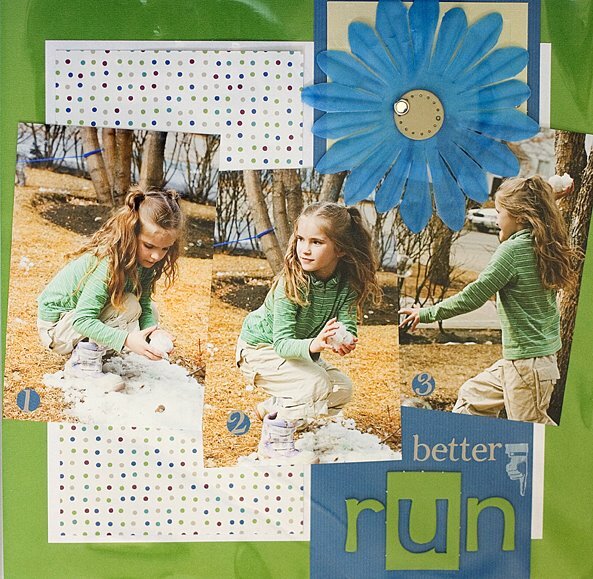 Published on March 20, 2008 August 9, 2016 by Bobbi-Jo G.
Yep, been in the mood 🙂 I’m so happy I’ve gotten more layouts done. I’ve been in a bit of a funk lately – in so many ways 🙂 Many of these were photos I’ve had sitting around for almost a year – about time they got some lovin’, am I right? 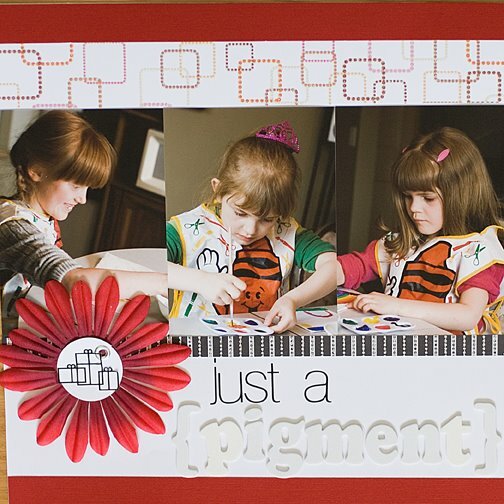 The first couple of pages is from the June Lisa Bearnson kit – made it so easy to display these photos of us from December. Easy peasy. 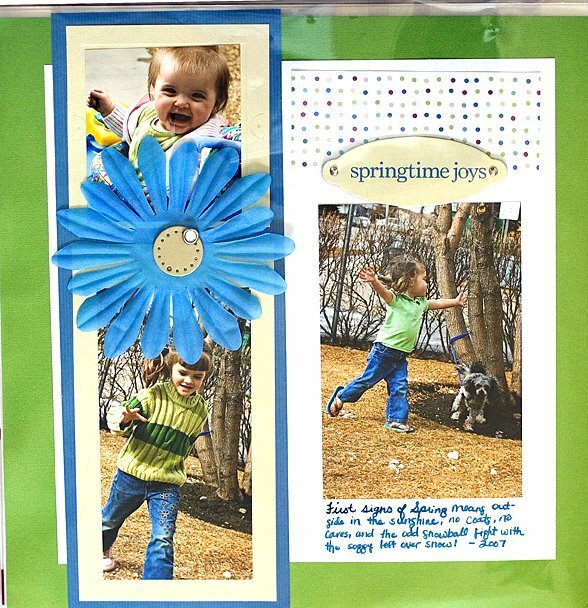 These photos were from LAST Spring, papers also from the June Kit, though I tweaked the pages quite a bit. These were papers from a fun paper slab from Michaels. You can’t really tell from these pictures, but the papers are all glittery. 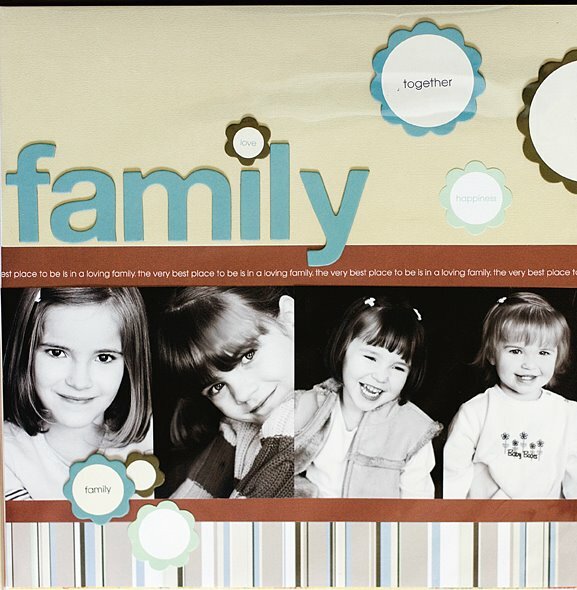 SO perfect for a family full of girls! LOL! These were pictures from my daughter’s birthday party last year. We have “theme” birthdays and my daugther wanted an “Artist” birthday. Instead of treat bags, we had all the kiddos paint a small canvas, then sent them home (complete with little easel) with a paint brush, small set of paints etc. 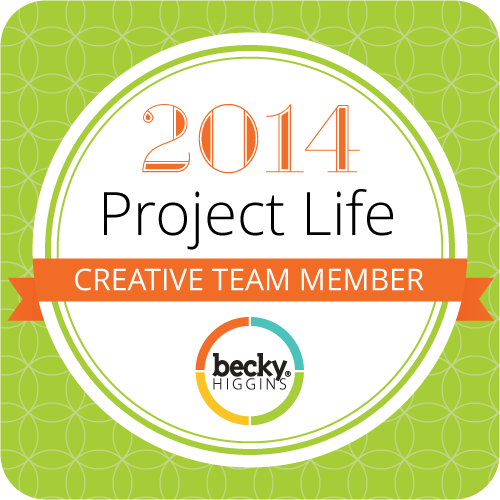 It was so much fun, and just LOOK at what they created! 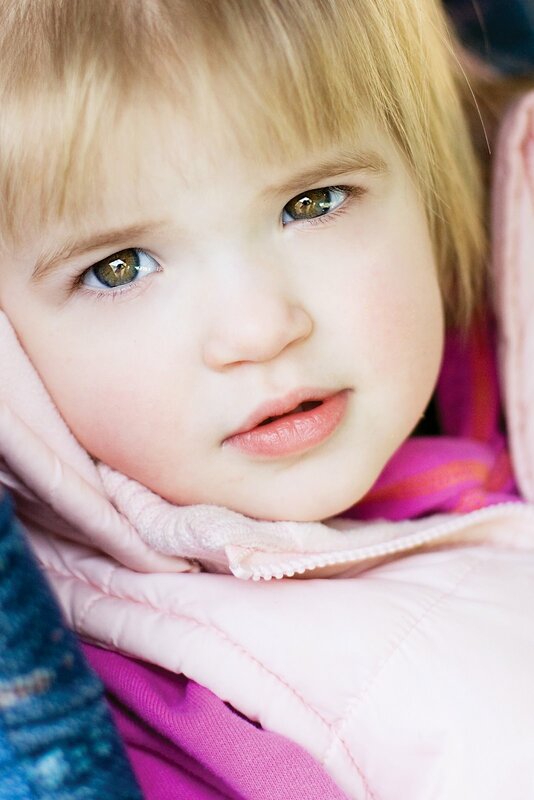 The second page is my daughter and a close up of her painting, entitled “Friends”. Awwww… They all did such nice work. 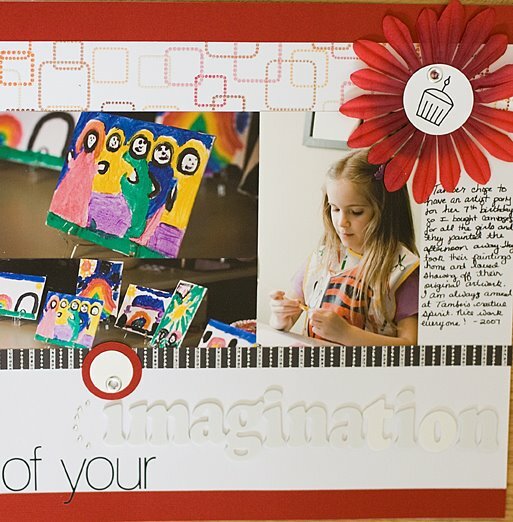 I especially loved my title on this spread “Just a pigment of your imagination.” I chose to do white on white for the title, and I like how it turned out. Just a play on “pigment”. So fun. 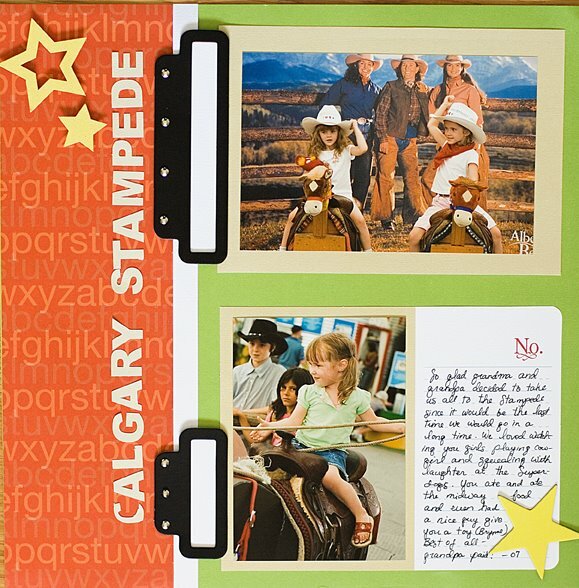 This was supposed to be a school page from the June kit, but since I’m doing something different for the kids’ school stuff, I used the papers for a layout about our last trip to the Calgary Stampede. I had quite a few photos from it, so I made a collage and slid it into the folder on page 2. I used my SIlhouette to cut out the title and the stars. SO easy, and I love how it turned out. Our Relief Society Enrichment March Party was a big success! We had about 45 people in attendance…4 of which were men (the Stake President, his 2 counselors, and my hubby). We filled all but 3 seats. I’m SO glad we didn’t need to scramble to set up more tables. I was getting worried for a second (we never have that many out to Enrichment Activities). The evening started with the guests choosing a Skittle out of a bag, and the color they picked determined the color of the table they would sit at. We only had two colors, 3 tables of each color, so they had SOME choice of where to sit. THe idea was to have them mingle with women they usually don’t mingle with. I think it worked nicely…there was a pretty good mix. I ended up sitting with my husband, Veronica B. (the enrichment counselor), and Pres. Hawkes of the Stake Presidency. Our table was the half empty one…go figure! We decorated the tables with a potted plant in the center which matched the color scheme of the table. 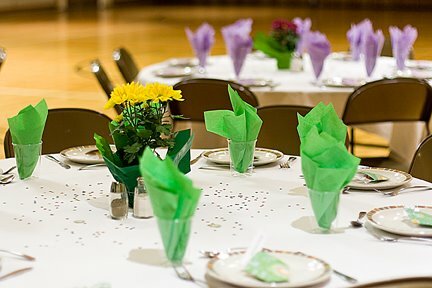 We had green/purple napkins in the cups so you could easily identify the table colors, and I had these cute little candy holders that I folded on each place setting filled with a little bag of skittles and a note that has our Ward’s Relief Society Theme “Stand Strong and Immovable” from Sis. Beck’s talk. I cut out some ornate butterflies that I taped under one seat at each table, and whomever was seated in that spot took home the plant as a prize. There was also some confetti sprinkled around the table top to add a little more pop. It looked so nice. We had a delicious roast beef dinner with mashed potatoes, spinach salad (which I NEED to get the recipe for – delish! ), yorkshire puddings (which filled the hallways with smoke since they prepared them at the church – not sure if that’s actually allowed, but it was the R.S. President who did it. Who am I to argue? LOL!) and some veggies. It was so yummy! We had some cheesecake for dessert and it was just the way to finish of the meal! Oooh, I can almost taste it now! The highlight of the evening was the fun game of “Relief Society Squares” which is a spin off of “Hollywood Squares”. Our 9 squares were the Stake President, His two counselors, the Stake R.S. presidency, and our Ward R.S. presidency. It was SO fun! They each represented figures from church history – some of them dressing up, like Pres. Shugart of the Stake Presidency who represented Ephraim Hanks and came decked out in a full head to toe suede and a hat reminiscent of Davy Crocket. It was the BEST! The contestants were my friend Ketrisse, and my hubby who was willing to fill in kind of last minute. Their character’s names were “Patty Perfect” and “Peter Priesthood”. I acted as the host of the game. If you don’t know how the game works, the contestant picks a square, the host asks the Square a question, and the square gives an answer. The contestant decides whether the statement was true or false. If they guess correctly, they get either an O or an X in that square. The goal is to get three in a row, like tic-tac-toe. The game was hilarious and everyone seemed to enjoy themselves. We were finished the evening by about 8:20pm, which was perfect! Everyone stayed to help clean up, so I was home by 8:30pm. Just right for me. LOL! That Enrichment Activity sure brings back FUN memories. I had NO idea that my “Peter Priesthood” was studying as hard as his “Patty Perfect” was! Grr…..I was out to win too! LOL!It sure was a fun night and so I am sure that your evening there was just as fun. I am so impressed that 45 women came. My My My! Way to get things going over there. Love all your layouts. You are just an endless fountain of talent.Have an Awesome Easter! You are one busy little lady! Love the layouts & what a gorgeous pic! Can I say that I LOVE your excitement for everything? I wish I could come and rub some of that off on myself. You are addicting girl.Once again, great job on the layouts. They look stunning, though I am starting to be less shocked by this fact each time you display your talent. (this is not a bad thing by the way).And your HF&PE night sounds like it was so much fun. What a great idea. Just reading about the food made me hungry…time for lunch. love all the layouts! You’ve been busy 🙂 Your rs party looked fun and sounded like a big success!! Your Releif Society night sounds like a blast. Don’t you find it interesting how wards outside of Utah are way more inclined to go to things like that and a little closer. I don’t know maybe that is just my opinion. IN Utah we just take advantage of the church a little because it is every where. 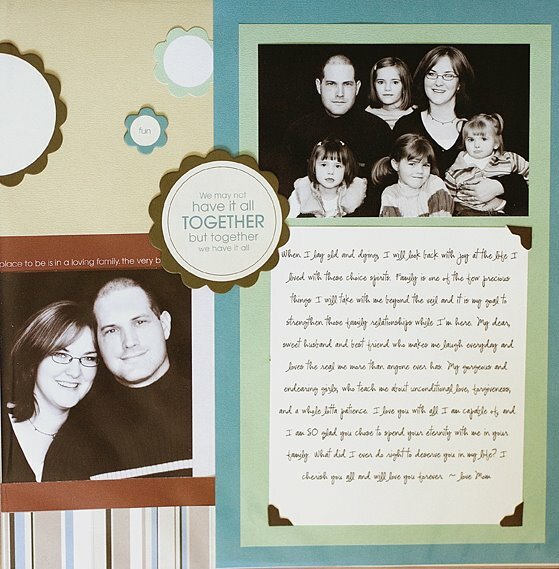 Love the layouts and I laughed when you mentioned lots of glitter for a family of lots of girls— or however you worded it because I looked at theat one layout with your family portrait and your husband is not smiling. Its a great picture but it made me think— I wonder if he ever feels bombarded by girls. And then you mentioned the abundace of girls in your house, so I laughed.Okay this comment has gone to long! Cute cute layouts! Love the table decorations and how you gave away the center piece. I bet that went over well. Fun stuff! Bobbi do you mind me asking what you shot with?? Your pictures are awesome!! I have a canon rebel xti but my shots aren’t as clear and crisp I need to learn how to use my photoshop, but I’m just wondering what you shot with and what your favorite everyday lens to use is?? If you don’t mind! Have a great easter weekend!